The main church in the small country of San Marino is Basilica di San Marino – fine example of Neo-Classical architecture. First church in this place was built more than 1500 years ago. The story of this church starts in the times of Ancient Rome. In 301 AD here arrived Saint Marinus – a stonemason and Christian, persecuted not only by authorities but also by an insane women defamating him on every possible occasion. He choose to climb the impressive Monte Titano and live a life of hermit, free from any state and religious officials. He built a small chapel here. Soon he was joined by other people and here was founded a monastery. San Marinese people lived proud and independent lives and by the 13th century this was a republic with strict and democratic legislation. 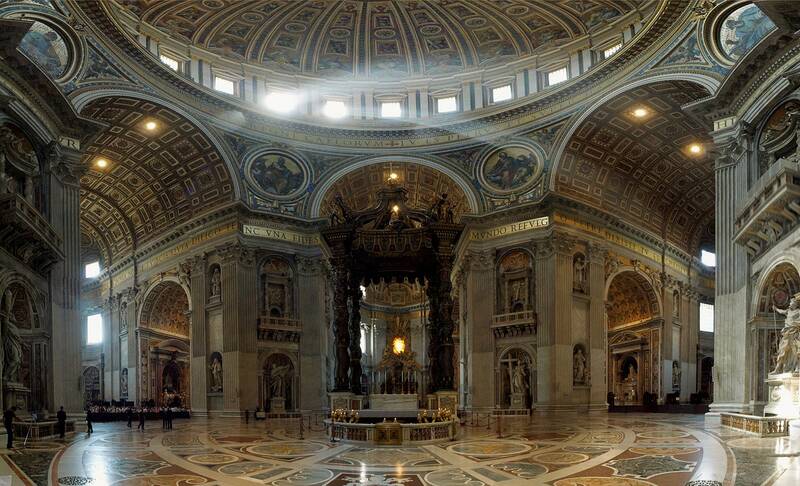 The earliest mention of the church in the site of present day basilica is from 530 AD. This – or a church constructed somewhat later (7th century AD) – stood here until the early 19th century. In 1586 under its altar were discovered relics of Saint Martinus testifying that this is the most sacred place in the republic indeed. By the early 19th century the ancient church was in dire condition and was razed down in 1807. 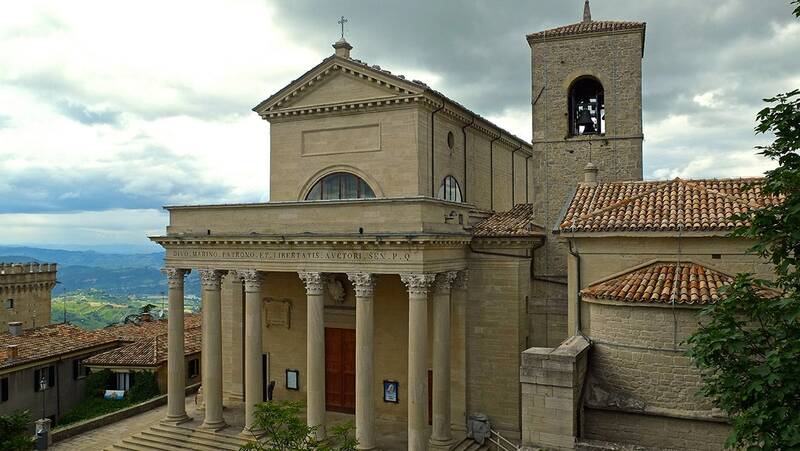 In 1826 it was decided to build a new church in the same site – it was designed by Bolognese architect Achille Serra. Construction continued for a fairly long time – until 1838. In 1926 the church was elevated to the rank of basilica minor and in 1982 visited by Pope John Paul II. The church was designed in Neo-Classical style and is expressive representative of this style. This is seen immediately when looking at the entrance – porch with eight massive Corinthian columns. 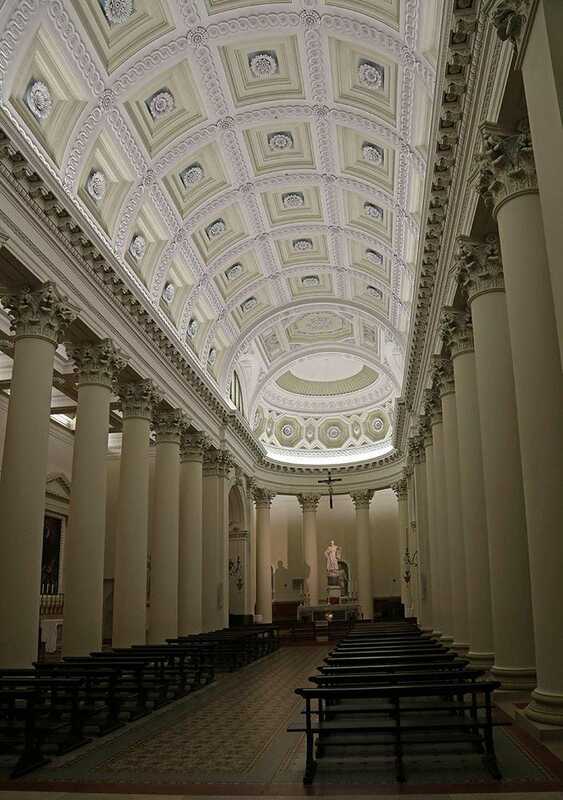 Also the interior represents this style – it is adorned with columns too and has fine ceiling with barrel vaults. Some of more famous artworks here are statue of Saint Marinus by the famous Adamo Tadolini and a painting by legendary Elisabetta Sirani. Next to the church stands bell tower which is older than the church, it is built in the 17th century. Basilica is depicted on the ten cents coin of Sanmarinese euro coins. In this beautiful microstate can be found numerous old structures which are located in a beautiful natural setting. 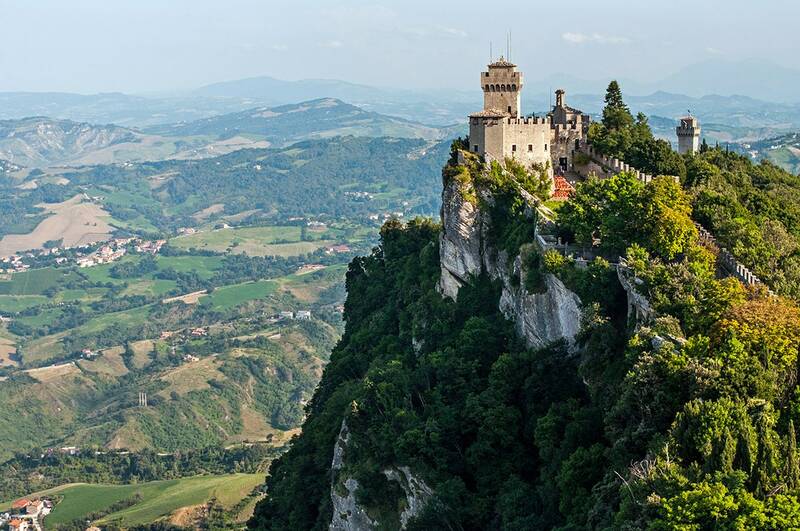 By far the most impressive is the ensemble of the medieval City of San Marino with its mountaintop forts, narrow streets and medieval buildings, with a multitude of views on the surrounding landscape far below. Most of the world’s straw hats and plenty of its shoes come from this fascinating Italian region. With stunning sandy beaches, superb food and wine, national parks, and world-class art (Raphael was born in Urbino, the most famous city), this is a must-have guide for all independent travelers. Each chapter comes with a detailed listing of restaurants, coffee bars and gelato parlors.